Cakespy Note: Just look at how cute these guys are (above, clockwise from the left, Jasen Samford, drums; Colin McBride, lead vocals/guitar; Danny Oleson, bass guitar). 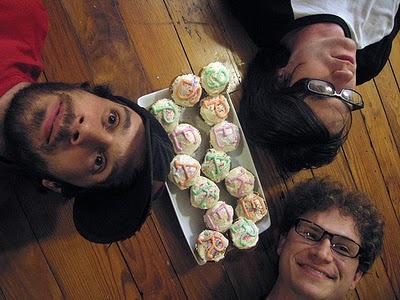 Why not celebrate that cuteness by buying their new album online at bbrecordings.com or at a record store near you? The first bit of sweetness on the road is found at Java Joe's Coffeehouse in Des Moines, Iowa. More coffee shop than bakery, their pastries are not made in-house, but rather come from a wholesaler; however, this didn't detract from the deliciousness of the molten chocolate baby bundt cake and chocolate indulgence, both of which were suggested by an employee. The molten baby takes the cake, with a rich, velvety texture that is felt not only in the mouth but right down to the soul; we'd take a bite of this baby anytime. Java Joe's Coffeehouse, 214 4th Street, Des Moines, IA; 515-288-JAVA (5282); online at javajoescoffeehouse.com. Moving on to the next town and the next show, the boys' next stop is at the large and inviting Lane's Bakery in Madison, WI,a bit of an establishment in the area, where they've been serving up a dazzling array of Kringle, gorgeous cakes, danish, bread and gift items since the 1950's. One of the items that intrigues us most on their menu though? The sweet Cherry-cheese "pizza", an appetizing tart-interpretation of the classic flavor pairing more commonly seen in cheese danish. Lane's Bakery and Gift Shop, Inc., 448 South Park Street Madison, Wisconsin; online at lanesbakeryandgifts.com. An unexpected bit of sweetness is found when the boys stumble upon Sweet On Chocolate in Syracuse, NY, a small confectionery shop with a mouthwatering array of handmade truffles. Upon an employee's suggestion Danny gets the pumpkin truffle; he is rewarded with a smooth, rich, and velvety treat with a wonderful tooth-feel and the perfect sensation of soft chocolate shell releasing the flavors within. Sigh. Sweet On Chocolate, 208 Walton Street, Syracuse, NY; online at sweetonchocolate.com (splash page only). To inquire about having chocolates shipped (they will do it, depending on the time of year) call (315) 478-0811. Moving on southward, the highlight of their visit to Austin, TX (you know, other than the show they play) is most definitely a visit to Mr. Natural, a veggie-friendly Mexican eatery with an amazing selection of baked goods including sweet empanadas, breads, cakes and pies; as a bonus there are plenty of vegan options (brownies and tofu pies), and they are able to make gluten-free pastries as well. Between them, our Gumshoes try the strawberry bar, a molasses bar, and a ginger cookie shaped like a pig; they are still raving about the rich and wonderful flavors. Yes, we heart Mr. Natural. Mr. Natural has two Austin, TX locations; visit mrnatural-austin.com for more information. International Delights Cafe (no relation to International Coffees) was a welcome sight as the weary travelers reached Las Cruces, NM. While several of the pastries were from local wholesalers, the standout was the made-in-house baklava, which was rich, studded with pistachio, and completely delicious. International Delights Cafe, 1245 El Paseo Rd. Las Cruces, NM, (505) 647-5956 ; online at internationaldelightscafe.com. The Virginia Bakery in Berkeley, CA marks the last stop en route back to Seattle, and what a sweet stop it is: the brown sugar walnut danish is a study in indulgence, being so rich that even the lead-bellied Danny is almost unable to finish it. Almost being the key word. Virginia Bakery, 1690 Shattuck Ave., Berkeley, CA, (510) 848-6711; online at virginiabakery.com. The weary travelers soldiered on up the coast back, happy to be back in Seattle; for indeed, as sweet as the tour was, it was sweeter yet to be home again. Do you have any on-the-road favorites? We want to know! Email jessieoleson@gmail.com with suggestions for our next road trip!